Hi there! Bundle Monster just released a new plate collection, it's called Shangri-La and consists of 10 square plates, which are sold as a complete set ánd as single plates. I'll tell a bit more about them below, but lets not wait any longer and take a look at them first! These plates offer so much variety! 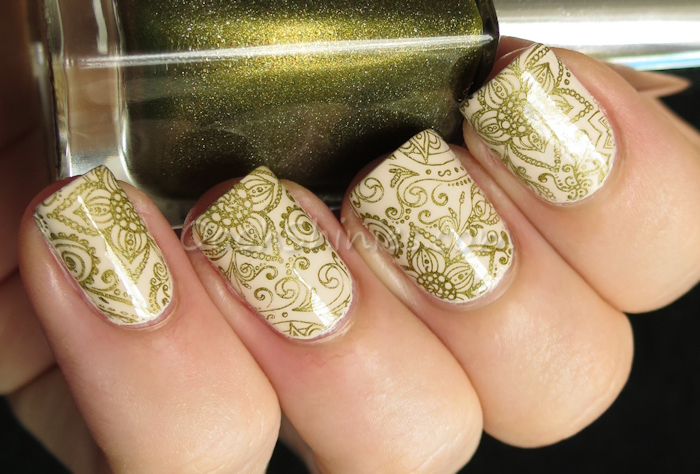 You can pick a single part of an image, like one of the circles above, and stamp it on all nails. Or go for different, but matching nails! That circle near the bottom right jumps out to me, depending on the colors used, you can maybe make it look like a flower as well (I'm thinking of yellow/white/green). 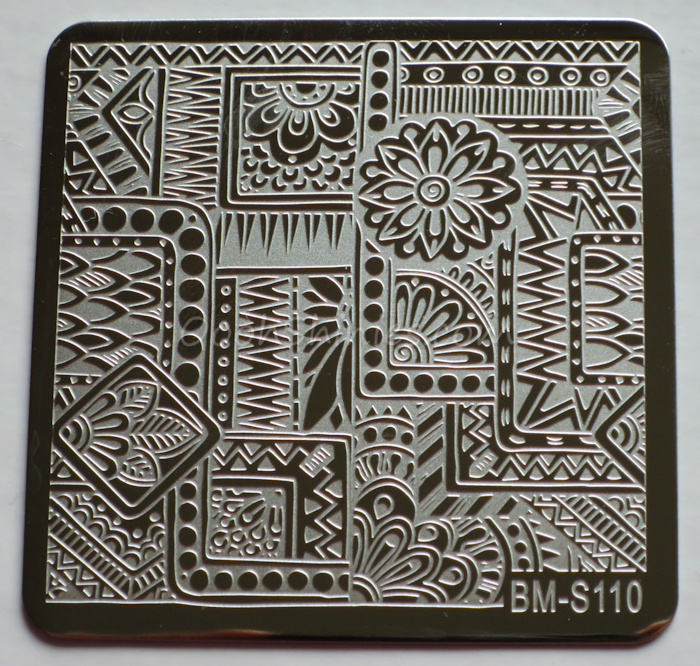 A lot of these plates will be perfect for some dotted details or loose glitters as well. 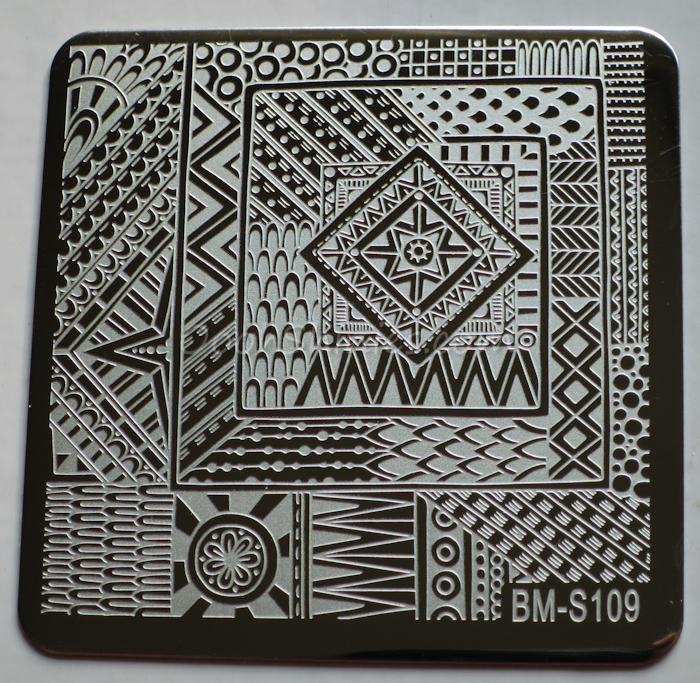 This plate reminds me a bit of an Aztec print combined with the Aztec Sun Stone, so I think the name of the plate matches well! Grab a bit of the print in black on a gradient, or take the pointy bits around the circle, or simply use one of those half circles at the bottom and stamp them vertically. Again, sooo much options. 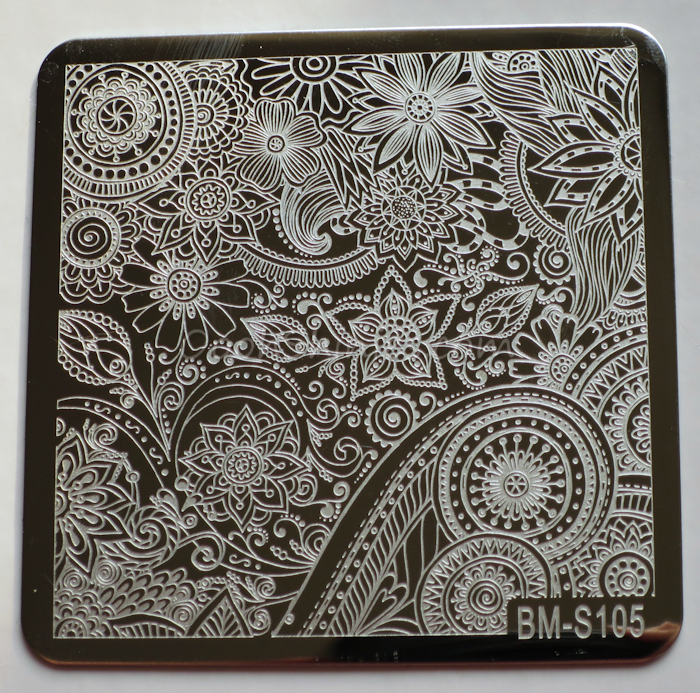 Stamp a flower, or just those little swirly dots, or that top right circle that looks a bit like a dreamcatcher. These small square plates aren't just cute, they're packed with good stuff! 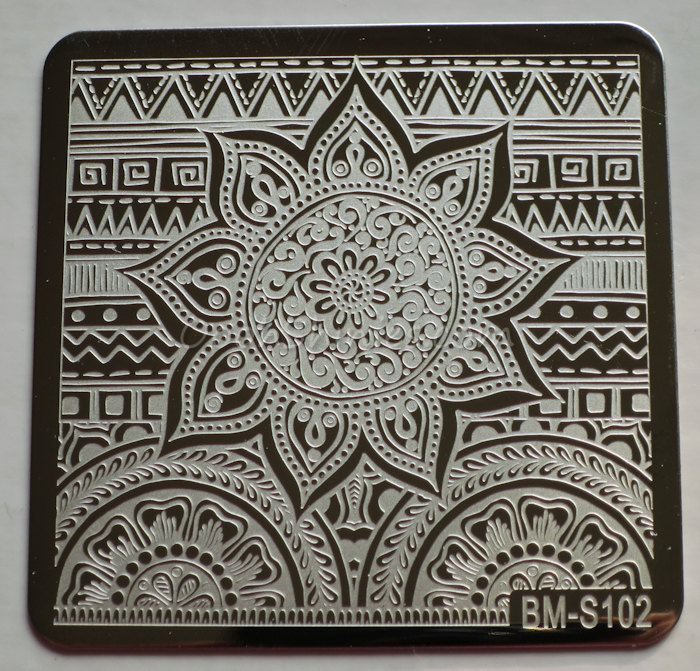 I'll tell you already, when I saw this plate I just had to go for a reverse stamping with it, doesn't it look like a perfect design to add some color to? 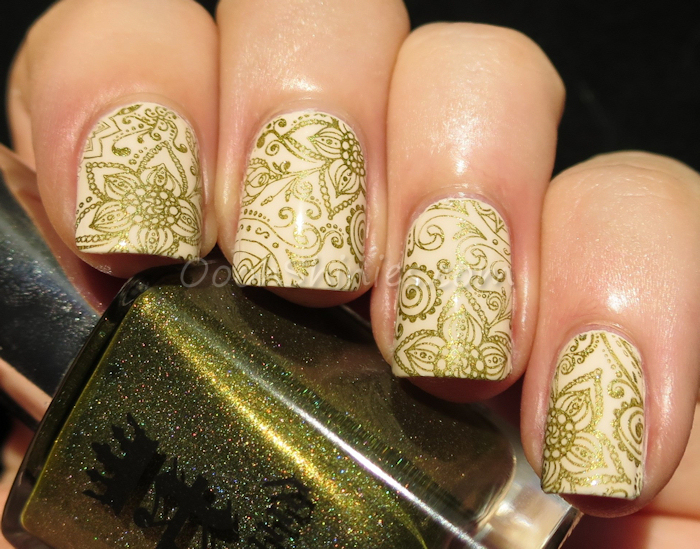 You'll see my result in an upcoming post :) This is one of my favorite plates of the set, such a happy & playful design! Is this a stunning plate or what?! 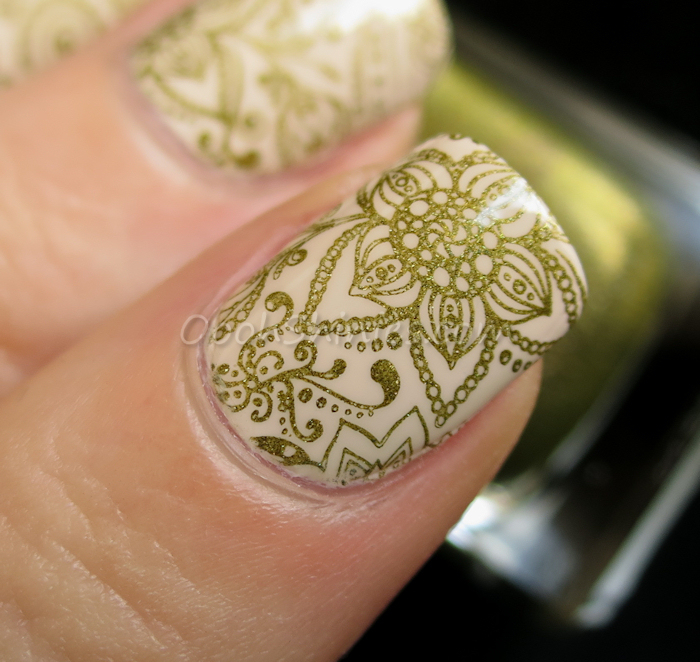 I'm so in love with it ♥ It's the plate that I used for the mani to go with this post, and I chose it because the lines on this plate are incredibely fine, so I figured it would be a good test. I took the middle flowery thing and the area around it, and stamped a random part with a bit of that flower on each nail. Here's a closeup of one of my nails, to show you how well these tiny lines transferred. The few little flaws that the macro shows are thanks to the user, not the plate, haha. You see it huge here of course, but I measured my nail to give you an idea, from cuticle to tip 1.4 cm / 0.55 inch. SO much details on such a small area, woah! Yeah, I wasn't done yet with the plates, but I just couldn't resist a macroshot in between! I like how this plate feels a bit repetitive, you can take a very similar image on each nail, but in slightly different sizes. Those little piles of rectangular shapes look great for some added coloring too. Another beautiful plate, you can combine the different flowers while creating unity thanks to the matching leaves, or take the outer pointy "leaves" of the image on the bottom right and stamp them near the cuticle with the pointy bit towards the tip. I feel like I'm on repeat, but yes, so much options here! 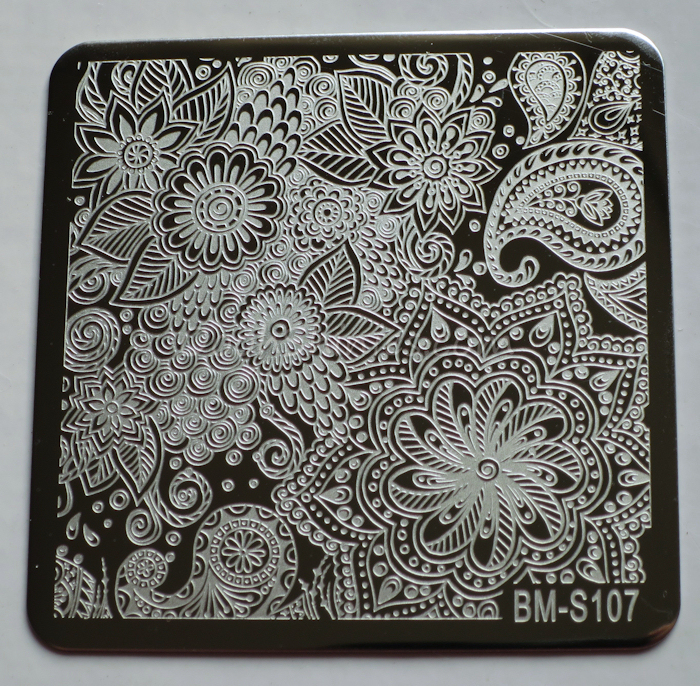 Take a small strip of a design, or just randomly stamp a piece of this plate. somehow it all goes well together even though it's all so different. If your nails ain't too long, you can also use the middle square as a full nail design. 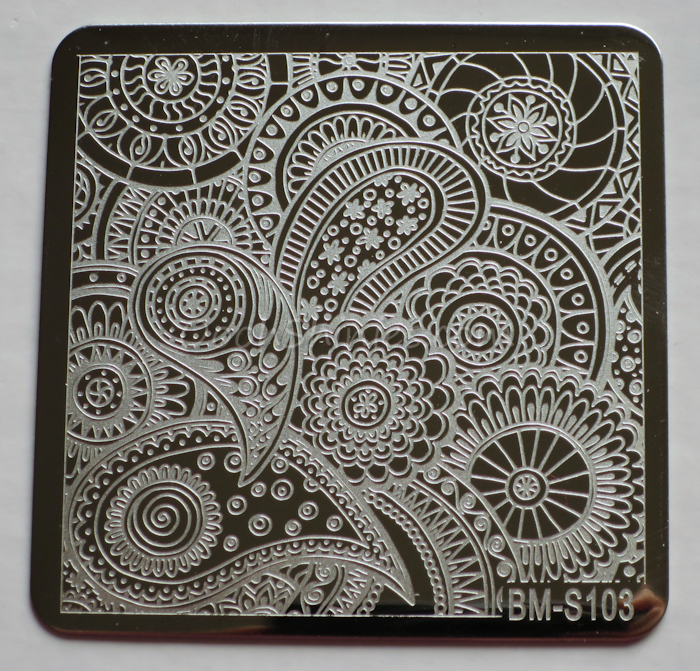 Same as the plate above, this'll be great for small parts, or just taking a big chunk of the image and randomly use it on your nails. 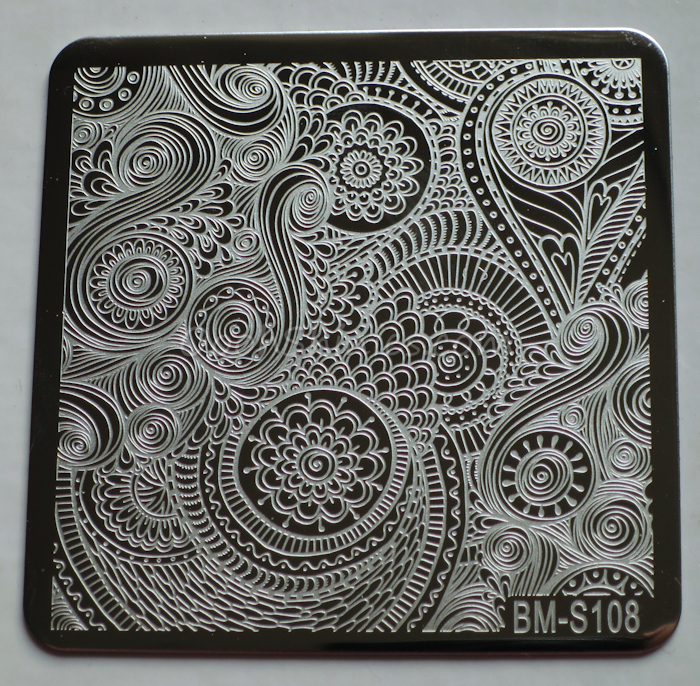 This might create nice reverse stamping too, what do you think? 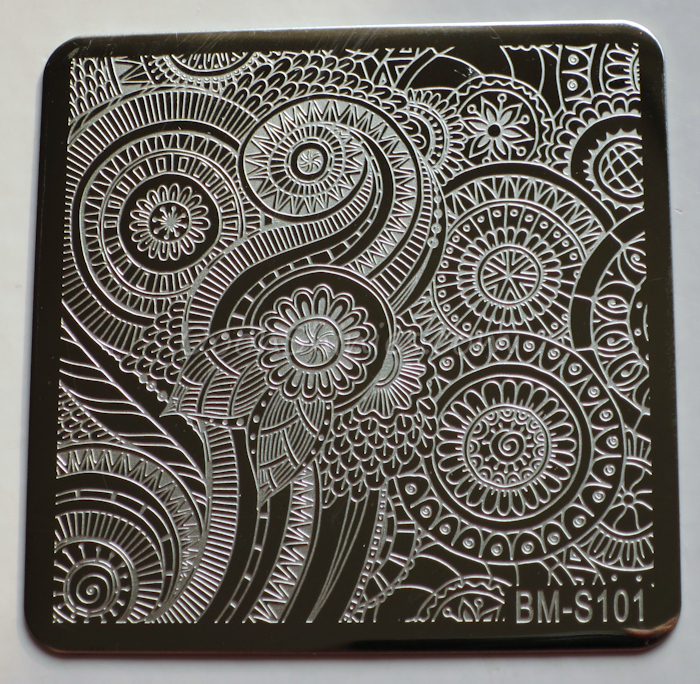 There we have it, 10 beautiful and unique plates, that work fantastic. 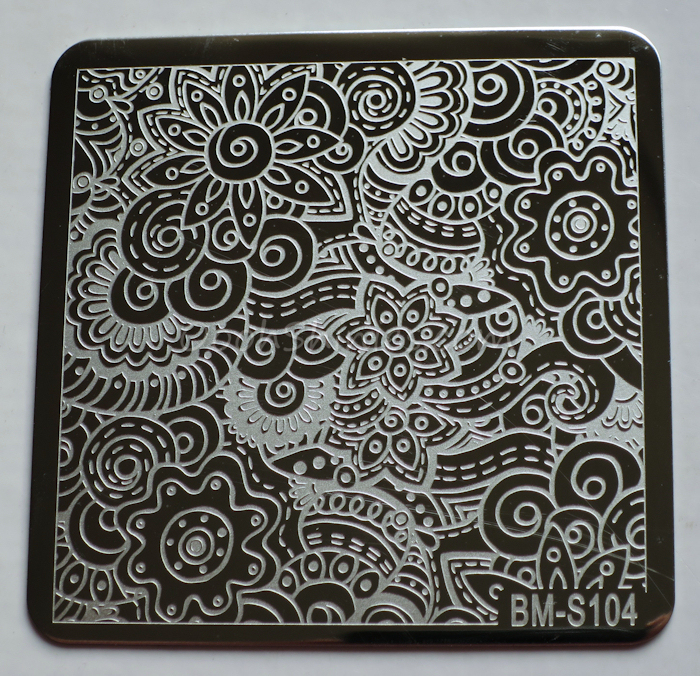 The plates measure 5.5x5.5 cm (2.16 inch), the designs are slightly smaller than that as you can see. 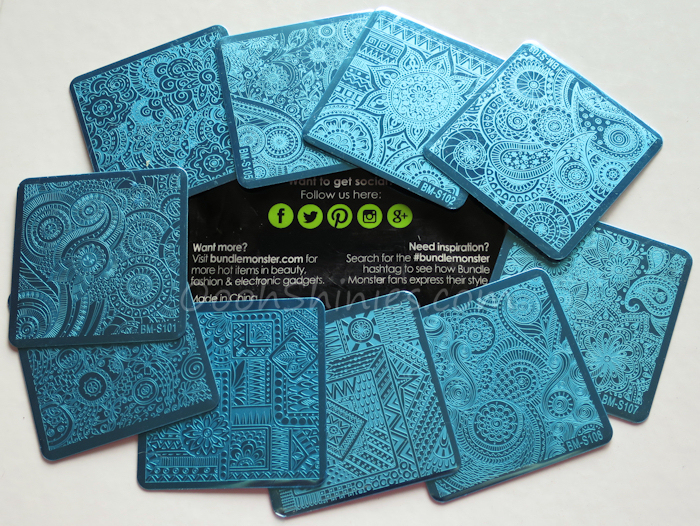 They come with the usual blue foil and protective back. I'm not sure if it's the square shape, or the designs, or a combination of the 2, but these plates feel refreshing! And the detail in them is simply amazing. I think it's really a lovely set, and even more so with their current sale price! 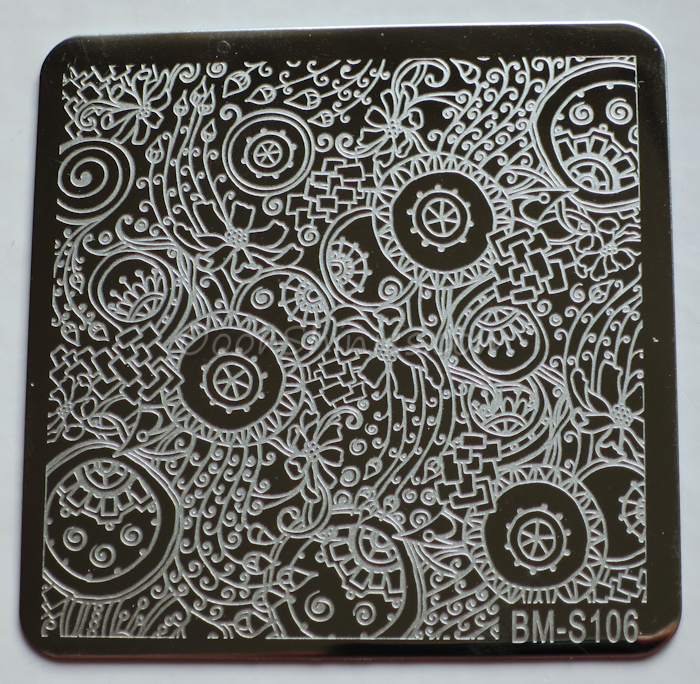 You can find the loose plates on the Bundle Monster website, they're $1.99 each. The 10 piece set is now for sale on their site, for $11.99 (normal price $14.99). What do you think of the Shangri-La collection, and how do you feel about the square shape? 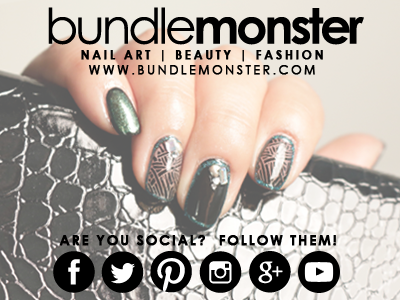 OPI My Vampire Is Buff with A England Fotheringhay Castle and Bundle Monster BM-S105.